(1934, Mascot) Clyde Beatty, Cecilia Parker, Warner Richmond. 12 chapters. 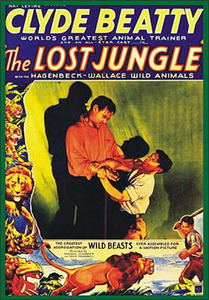 Beatty leads a rescue party in search of his gal pal and her father who got lost looking for a remote jungle isle. Efforts are stymied by wild game and greedy gold hunters. 16mm.